Cyron 3-channel RGB data repeater. 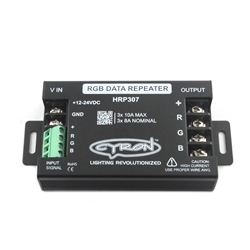 Get up to 500W additional output power by adding HRP307 to any CYRON RGB controller. Can combine multiple HRP307s in parallel, or series, to create any output power. Rugged aluminum housing for durability and proper heat management. 1 year warranty.